107 Years of Service Edythe Kirchmaier, EX '34, came to SSA more than 80 years ago to prepare for a life of service. We honor her service to others. Edith passed away on October 24, 2015. Edythe King Kirchmaier, EX '34, came to the University of Chicago School of Social Service Administration more than 80 years ago to prepare for a life of service to others. Mrs. Kirchmaier, SSA's oldest known former student, was 107, was Facebook's oldest user, and an insipiration for people who believe in the value and power of volunteering. Edythe Kirchmaier, the University of Chicago School of Social Service Administration's oldest known former student, turned 107 on January 22, 2015. 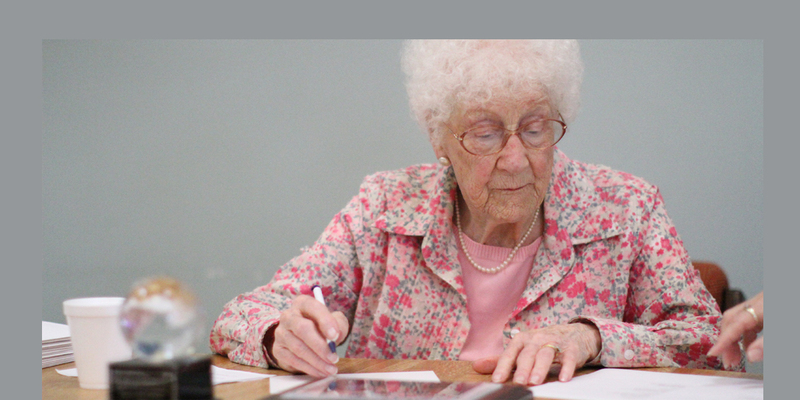 A 40-year volunteer for Direct Relief in Santa Barbara, CA, Mrs. Kirchmaier spent her Tuesdays writing thank you letters to donors. She drove herself to work and was fondly known as Edythe among the agency's many volunteers and staff members. Direct Relief is a leading humanitarian medical relief organization, active in 70 countries and all 50 U.S. states. To honor the active centenarian and celebrate her 105th birthday two years ago, Direct Relief hosted a Facebook application called Edythe's 105th Birthday Challenge that allowed people to wish her a happy birthday by lighting a candle on the world's largest virtual birthday cake and becoming a fan of her beloved charity. The goal of Edythe's 105th Birthday Challenge was to generate 105,000 birthday wishes, which will equate to 105,000 Facebook fans for Direct Relief and make her birthday wish come true. Direct Relief now has more than 130,000 fans. 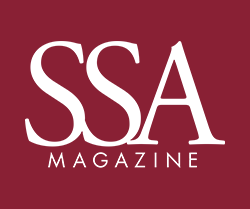 While a longtime supporter of Direct Relief, her story of working for social justice goes back to the early years of the University of Chicago School of Social Service Administration. Edythe King graduated from the Ohio State University in 1930 and spent spring quarters from 1931 to 1934 taking courses and doing field work at a time when some of the legendary figures of the SSA faculty were teaching. She took a class with Edith Abbott, the first Dean of SSA, for instance, and remembers her as being "very strict." Working with children was one of her interests when she was training to be a social worker and she pursued that work in field assignments. She lived at the Howell Neighborhood House (now Casa Aztlan) on Racine in Pilsen, the current Mexican community that was then a Czech neighborhood. During the Great Depression, "social workers were in great demand and a person interested in social work would have no problem attaining a position if they had at least a class under their belt," she says. "You didn't need a degree as the needs were too great at the time anyway." She recalls people being cooperative at the time and eager to help each other. While she was working, she also lived at Hull House for several years at what was called the Jane Club – a cooperative for working women. She helped with Hull House programs – working with teenagers, specifically Mexican immigrant girls whose families were receiving aid. She remembers helping them adjust to American culture, but also remembers that immigrants were better received at that time. Historically, social work has always attracted more women than men to the profession, but in the 30s this emerging profession allowed women to join the workforce as equals. "It was exciting for women back then – to be able to work with and alongside the men," she says. She eventually took a job in the welfare department of Cook County and in a state welfare office, where she became a supervisor. It was there she met her soon to be husband, Joe Kirchmaier, who came to work at the state in 1938. Mr. Kirchmaier was a 1937 graduate of SSA and was "two years younger than me," she says with a giggle. "That was something back then." They soon married and would have two children. Mr. Kirchmaier completed his undergraduate courses at the University of Rochester and spent the summers at a music camp in Santa Barbara, CA. A few years into their marriage, Joe suggested that they move to Santa Barbara, as he described it as "one of the most beautiful places in the world." He initially took a position with the Red Cross as a Field Director in Lompoc, CA at Camp Cooke near Santa Barbara, where the couple assisted military families in finding places to live. In 1948, they moved to Santa Barbara where Mrs. Kirchmaier took a job with Santa Barbara's department of family services and counseled children and young people. Her late husband worked at the county hospital as a Director of Admissions and Social Services. Upon retirement, they threw themselves into volunteerism – and dedicated much of their lives to Direct Relief.